Vitali Klitschko is one of the best boxers in the world’s history. The outstanding sportsman got famous for his successful results in the ring; his professional box achievements are truly remarkable. 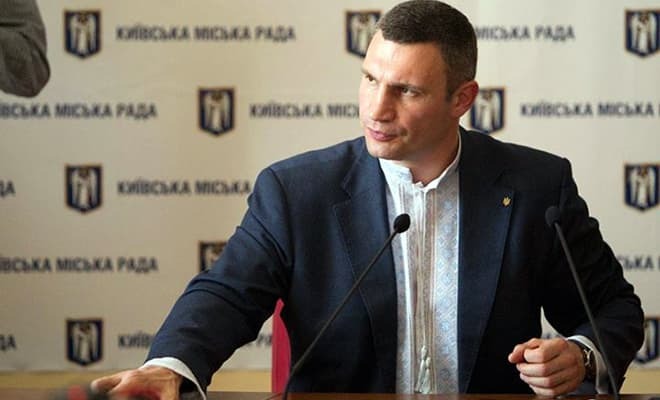 At the moment, Vitali Klitschko is the Kiev mayor; he is also the head of the political party UDAR (“Ukrainian Democratic Alliance for Reform”). His activities stretch far beyond the limits of the traditional politics: the current mayor has a fascinating story in the professional sport, he is a businessman, and quotes from his speeches go viral. Vitali Klitschko was born on July 19, 1971, in the village Belovodskoye, the territory of the former Kirghiz Soviet Socialist Republic. His father was a military man; the mother worked as a primary school teacher. 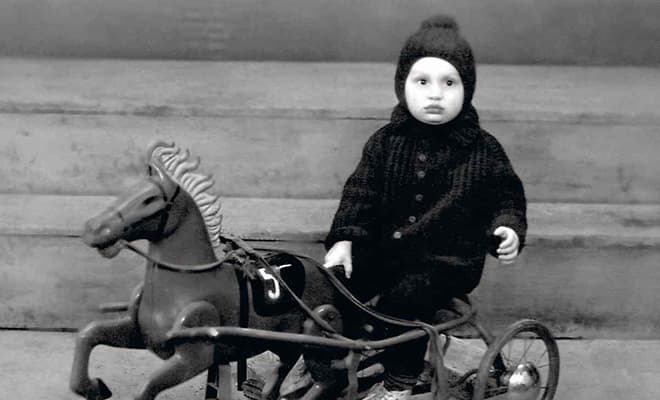 The boy’s family had to move frequently to other countries and Soviet republics. In the early 1980s, the family lived in Czechoslovakia; in 1984, the Klitschko moved to the Ukrainian Soviet Socialist Republic. In his ancestral territory, Vitali began to do sports on a regular basis. Vitali’s great sports future was predetermined since his childhood: since the early age, the boy was fond of professional fights. The young man liked many combat sports; kickboxing was his favorite. Vitali won the title of the world’s best kickboxer six times. He had 35 fights and won 34 unprecedently. 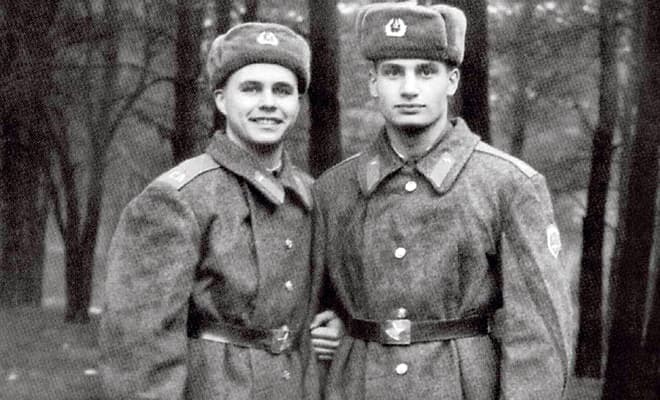 From 1989 to 1991, the young man did the military service in Uman, one of the Soviet Air Forces military bases. At that time, he was notable for his sizes and physique. The famous boxer often mentioned the service in the Air Force later. In one of his interviews, Vitali told journalists that one of old-timers tried to make him bring water; however, the new solider was not satisfied with this scenario. As the boxer refused to obey, he risked his wellbeing: discharges were almost ready to “bring discipline” in their domain but everything ended soon. It was announced that the champion of the Soviet Union Vitali Klitschko is among the new soldiers. Since that time, nobody ever tried to violate the service regulations. After the military service, Vitali studied at the Pereiaslav-Khmelnytsky Pedagogical Institute named after Gregory Skovoroda, Faculty of Physical Health Education. Later, he continued his service as an officer in the Ukrainian army. In 1996, Klitschko was transferred to the reserve in the rank of Air Force captain. After the successful period in kickboxing, Vitali Klitschko switched to the professional box where he manifested himself since 1995: the sportsman became the world’s champion among military men and won many fights. In November 1996, he debuted in the professional ring simultaneously with his brother Wladimir; by that time, he had a successful career in the amateur box: 95 victories, 80 knock-outs, and 15 defeats. In 1999, Vitali Klitschko won the title of World Boxing Organization champion but lost to the American sportsman Chris Byrd next year. It was the first defeat in the professional career. In the last rounds, he actually surrendered and gave the victory to the American boxer. Initially, the Ukrainian boxer should have fought Donovan Ruddock, but the Canadian sportsman had some health problems the day before the fight; thus, Byrd replaced him. 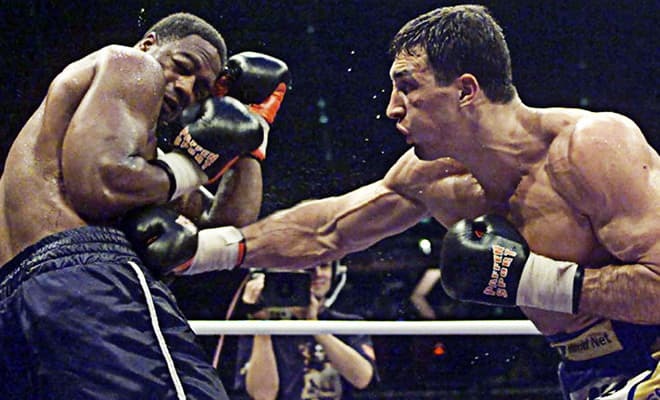 Vitali’s injured shoulder was the reason for the loss: he could not finish the bout the usual way and gave up voluntarily because of the unbearable pain. On June 21, 2003, the legendary fight with the British sportsman Lennox Lewis took place in Los Angeles. Between the 6th and 7th rounds, the fight was stopped and Lewis got the victory due to the technical knockout: Klitschko had his left brow split badly. These results are still considered controversial and the British’s victory is sometimes called unjust. 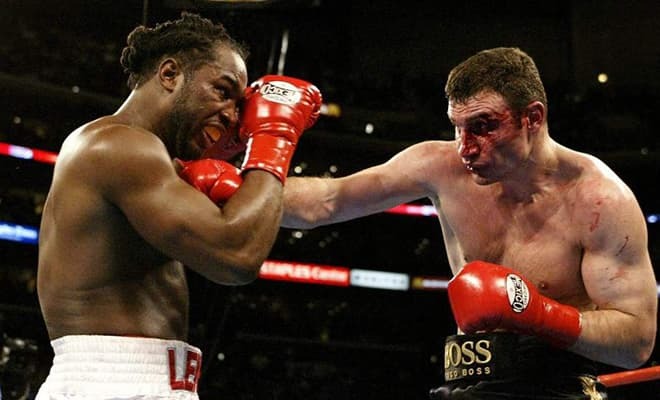 In 2004, Vitali defeated the American boxer Corrie Sanders and became the World Boxing Council (WBC) champion. With that title, he announced he was leaving the professional sport in November 2005. Vitali stated he had to end his career because of his trauma. In 2007, Klitschko planned to return to sports fighting but the de-facto come-back happened only the next year because the sportsman had another serious injury in 2007. At that time, he faced some health issues with his back, and only the surgery helped. After the three-year pause, the first fight took place in December 2008 in Germany. 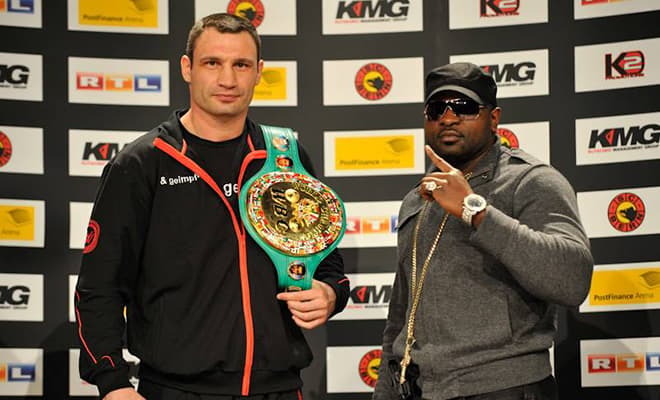 The Ukrainian sportsman fought Samuel Peter, the WBC champion. Vitali was constantly dominating in this fight, so Peter refused to continue between the 8th and 9th rounds. In December 2009, Vitali Klitschko broke the record and threw 749 jabs in the super heavy weight during the fight with the American boxer Kevin Johnson. In May 2010, Klitschko defended his title in the fight with the European Boxing Union Champion Albert Sosnowski (aka “Dragon”) from Poland. In October, there was a fight with the American Shannon Briggs. In February 2012, Vitali defeated the British sportsman of the Zimbabwean origin Dereck Chisora who often offended the brothers Klitschko. His rudeness was punished. 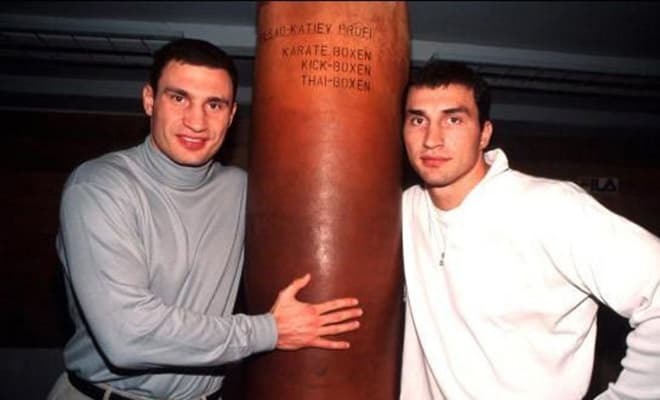 In 1999, Klitschko was included in the Guinness World Records as the first world’s champion in the super heavy weight who won 26 fights by knockouts. To reach this result, he took the fewer number of rounds in comparison with the previous record of the famous boxer Mike Tyson. WBC named the Ukrainian boxer the best puncher in the history of the super heavy weight division. Vitali Klitschko was the world’s champion in professional boxing according to WBO (1999, 2000) and WBC (2004, 2005, and 2008). 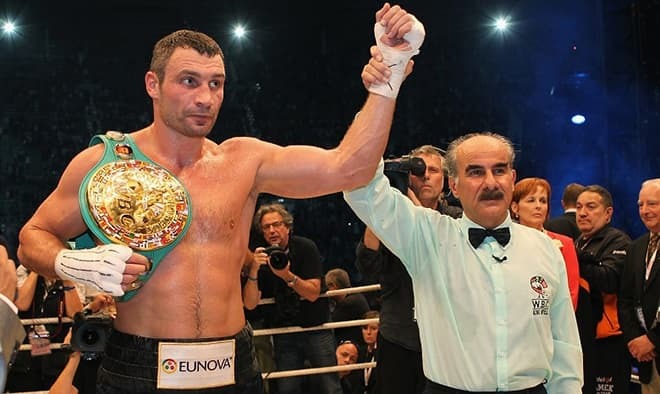 Vitali is the six-time world’s champion in kickboxing, the champion of the First Military World Games, the three-time boxing champion of Ukraine, the multiple champion of Europe among professionals, and silver medalist of the World Boxing Championship Among Amateurs. Vitali has been awarded the title of the Merited Master of Sports of Ukraine. 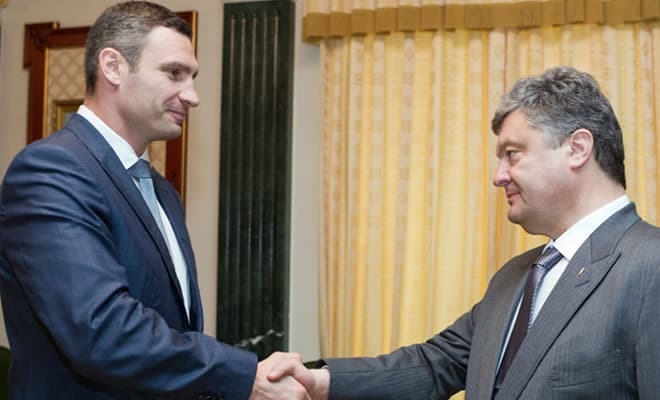 In April 2006, Vitali Klitschko was elected as the deputy of the Kiev City Council. In October, he became the adviser to the Ukrainian President Yushchenko since the famous sportsman was an active supporter of the Orange Revolution. Vitali Klitschko ran for the position of the Kiev mayor in 2006 and 2008 unsuccessfully. In April 2010, he was elected as the major political party UDAR (Ukrainian Democratic Alliance for Reform) leader. In 2014, almost 56.7% of the voters chose Vitali Klitschko as the Kiev mayor. Politicians from all over the globe sent their greetings to the new city chief who was particularly happy with his brother Wladimir’s and his wife Hayden Panettiere’s support. Klitschko’s program contains five main lines some of which include the clear and optimal usage of the Kiev budget, fighting corruption, permanent dialog with citizens, and comfort of living increase. Today, the city administration chief tries to fulfill his promises and follow his political program. The newly appointed mayor started with illegal street furniture combat: he took action against kiosk owners who did not pay taxes to the city. Another novelty touched upon the public facilities in the capital: as the former boxer became the mayor, the prices increased by half or twice which made citizens dissatisfied. 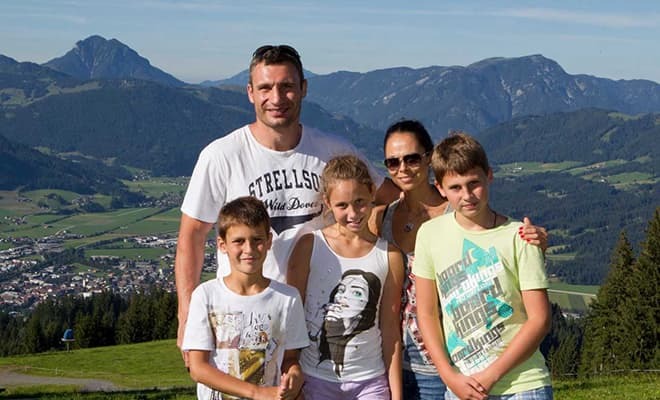 In 2013, Vitali Klitschko was engaged in the current social processes. Since November, Klitschko, the Ukrainian people’s deputy Arseniy Yatsenyuk, and the leader of the All-Ukrainian Union "Svoboda" Oleh Tyahnybok headed the protests in Ukraine. The Ukrainian events in 2014 were the landmark in Klitschko’s life. Many people who did not agree with the authorities’ politics saw Vitali Volodymyrovych as the president of the country. 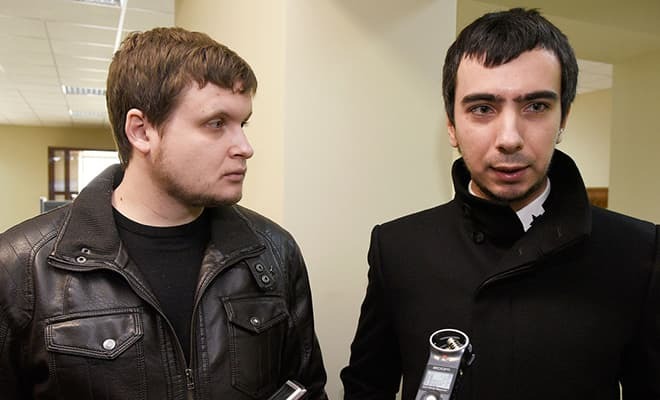 During the Euromaidan, the figure of the famous person instilled people’s belief in the victory. Many people believed in Klitschko and considered him to be a strong leader capable of changing the situation for the better and guiding the Ukrainian people to prosperity. To some extent, this “people’s belief” helped Klitschko become the Kiev mayor. However, the revolution participants were soon disappointed in the former boxer’s actions because the party “URAR” and the pro-presidential “Petro Poroshenko Bloc "Solidarity" merged. The politician publicly announced he was going to run for the presidency on May 25, 2014. However, he rejected this idea later, to all Ukrainian political elite’s surprise. 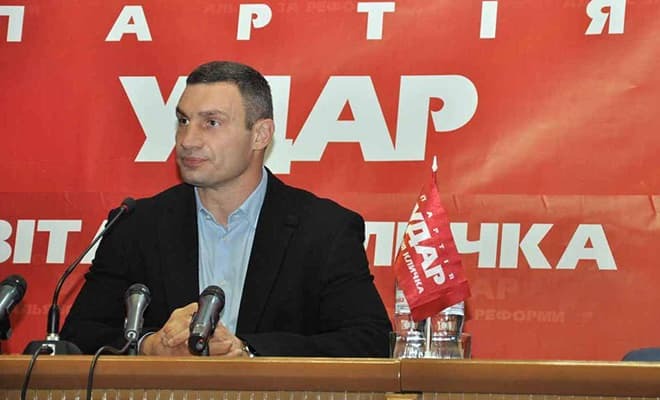 Just before the presidential elections, Vitali Klitschko’s rating deteriorated, and he had no confidence he could win. Thus, Vitali Volodymyrovych set his priorities and decided to give up the presidential ambitions to take part in the mayor elections. Vitali Klitschko’s personal life is not kept secret from the media as it sometimes happens in politicians’ lives. Since April 26, 1996, the present-day Kiev mayor has been married to the former photo model and sportswoman Natalia Egorova who took the husband’s second name after the marriage. The woman has always supported Vitali during his fights. There are three children in the family, two boys and a girl. The first child Egor-Daniel was born in 2000; the daughter Elizaveta-Viktoria was born in 2002. The third child Maksim was born on April 1, 2005. According to Forbes, Vitali Klitschko’s fortune cost $43.9 million in 2016. These figures were published by American analytics who based their research on the e-declarations provided by Ukrainian bureaucrats in 2016. Thus, the Kiev mayor was number 11 in the list of the richest Ukrainian bureaucrats and people’s deputies. Klitschko’s quotes went viral in the society, and Internet users began to photoshop various videos and photos of his speeches. Some of them have millions of views on popular hostings. Jokes about Vitali Klitschko are very popular on the Internet and in the media. The Kiev leader’s utterances are often funny, even absurd. 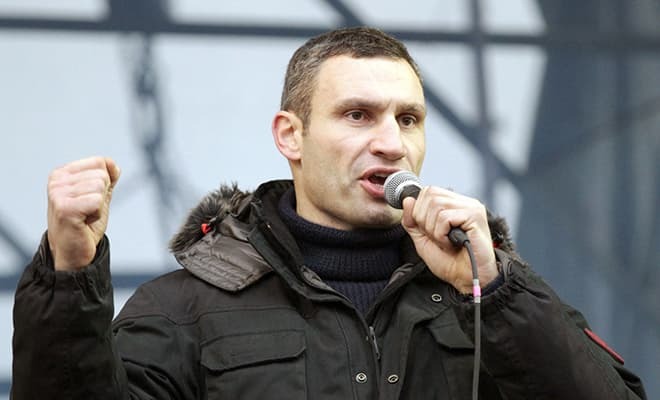 The former sportsman is aware of this popularity: Vitali was going to publish a collection of his quotes in Russia so that he could provide Kiev citizens with heating using the money he would gain. In 2016, many Internet sources informed that Russian prankers Vovan and Lexus played a trick on Vitali Klitschko and communicated with him in English to discuss security measures during Eurovision-2017. One of the most popular jokes about Vitali Klitschko is about his slip of the tongue when the Kiev leader encouraged people to “prepare for the soil” – he made a mistake in the word “winter” in his speech related to the upcoming winter and heating season preparation.